Security is very important to most homeowners. It is always good to be prepared for and protected against intrusion. When it comes to ensuring the highest level of security however, there seems to be many options available. Because of this, some people do find it hard to choose a security installation that combines strength, durability and looks to meet their needs. If you are looking for heightened security in your home, you should look towards aluminium security doors. Standard doors and screen doors are susceptible to break-ins. In fact, break and enter offences are not uncommon in terms of unlawful activity. When it comes to aluminium security doors, there are many benefits on offer. Five of these stand out in particular, and these are listed below. The most obvious advantage of aluminium security doors is security. Aluminium is a strong, albeit lightweight, substance that can withstand enormous force. This means that any standard attempt to break and enter your home will be prevented. Such attempts include kicking, cutting and barging. High quality aluminium security doors offer even more than this, however. The most reputable security companies offer aluminium security doors with a difference. This usually includes deeper welds and heavier door frames. Deeper welds protect your security doors against more targeted and pre-emptive attacks. Some lesser-quality security doors can be compromised by targeted strikes to the mesh. Typically, the door is weakest where the mesh meets the frame. This means that anyone with a bit of experience or inside knowledge can compromise your door quickly and even quietly. With a high quality aluminium security door, however, the deep welds will prevent this. When a heavier doorframe is also present, you get unrivalled security. A lot of homeowners express concern with regard to fire safety, when it comes to security doors. If a security door is locked from the inside and a fire starts, then the occupants risk becoming trapped if they do not have the key. This is a valid concern, but aluminium security doors have the answer. VS aluminium security doors offer a keyless escape system. This system allows the occupants of your home to escape without the need for a key in the event of a fire. The keyless escape system is know as ‘Safe-S-Cape.’ It works by allowing the door to be removed thanks to a unique hinge system. Don’t worry though – this does not compromise their strength. In fact, Safe-S-Cape systems are among the strongest aluminium security doors on the market. In addition to enhancing your personal safety, they also make it much easier to clean your screens. You can simply remove them and clean them as necessary. Aluminium is perhaps one of the most durable products used in security doors today. Unlike iron and some steel products, aluminium does not rust. In fact, aluminium is so resistant to corrosion that it is widely used for marine applications. By choosing an aluminium security door, you can ensure that your door does not weaken over time. This is a real problem for some security installations. If you live near the beach or a tidal waterway, then rust is a real threat. You might not notice it but salt particles are carried from the sea by the wind. This means that your home will be getting salt on it regardless of whether or not it actually gets wet. Consequently, the rusting process will be rapid but discrete. Ultimately, it can cause your iron or steel security doors to lose almost all of their strength. With aluminium security doors, rust is simply not a problem. Regardless of how close you live to a marine environment, your aluminium security door will retain its strength. This is aided further by the Safe-S-Cape system, which allows you to clean the door easily. Simply remove the door in accordance with Safe-S-Cape process and clean it thoroughly. This make it last even longer. Many homeowners do not make the link between security and energy efficiency. Despite this, there is a very tangible connection between the two, especially in Queensland. If you have to shut your doors at all times for reasons of security, then your home will have less airflow. In the middle of summer, this can be a problem, as temperatures often exceed thirty degrees Celsius. To maintain a comfortable living temperature, you then have to turn to your air conditioner. Air conditioners use a considerable amount of power. This means that your energy bill will probably skyrocket over the summer period. 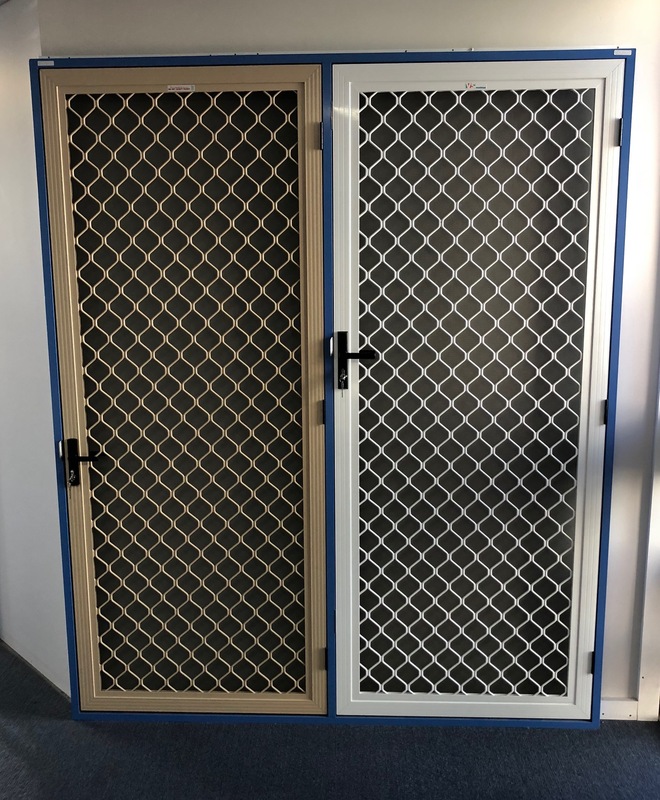 If you have an aluminium security door, then airflow will not be an issue. Aluminium security doors are available as screen doors. This means that you can shut and lock them, safe in the knowledge that you are secure. Air can still pass freely through your house and you will have far less reliable on your air conditioner. This saves you a great deal of money on electricity bills. As well as that, it also contributes to a healthy environment and a smaller carbon footprint. Finally, aluminium security doors look great. Looks are one of the main reservations that homeowners express when it comes to security installations. Many homeowners are concerned that security doors might make their home look prison-like or unwelcoming. With aluminium security doors, you get quite the opposite. Aluminium security doors encourage an ambience of welcoming and can even be used as design features in some homes. Having a screen door makes your home feel and appeal welcoming and breezy. Fortunately, aluminium security doors offer both this and great security. Therefore, you can maintain a welcoming ambience, while enjoying the peace of mind that comes with unrivalled security. There are different types of aluminium security doors available, so have a chat with your supplier. They will be able to help you find a security door that meets you visual needs, while also keeping you and your family safe. Do you need aluminium security doors in your home? Contact the security experts at Vincent Security today on (07) 3849 4555.